Indigenous Veld Goat breeder Erik de Witt is following his dream of preserving indigenous livestock breeds. Sabrina Dean visited him and learnt that with innovative marketing, it is also possible to make handsome returns on these unique animals. A flock of Xhosa Lob Ears heads to the kraal at sunset. It is late afternoon at Erik de Witt’s farm, Leeuwkop, near Koffiefontein in the Free State. Most of the family are present and everyone, down to six-year-old Widru, is involved in the daily chores. These include matching lost kids with their mothers, making sure a group of recently born kids get enough milk from surrogate nannies, and transporting lick to the cattle. Today, one more task has been added to the list: selecting the finest of their Indigenous Veld Goats (IVGs) for a photo shoot. Erik has a deep-rooted love for indigenous goats that was fostered by his mother, Paulina Myburgh (formerly De Witt). As Erik’s wife, Welmari, tells it, Paulina started farming goats, Kalahari Reds initially, because she wanted something she could call her own. She later fell in love with the dappled IVGs she saw on a visit to the farm of a prominent breeder. “She started with indigenous goats because she thought they were beautiful,” says Welmari. 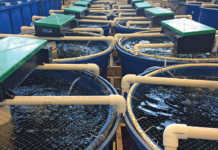 IVGs comprise several separate ecotypes and Erik runs three of these on his farm. He breeds the Xhosa Lob Ear and Northern Cape Speckled, while his eldest son Dian, 12, has invested in the smaller Mbuzi ecotype. Erik has been farming with IVGs for about 11 years. He is also interested in other indigenous livestock types and his breeding operation, Madiru Small Stock, extends to Damara and Meatmaster sheep and PinZ2yl cattle. He has about 250 sheep, 100 “stud-quality” goats (reduced from more than 200), and approximately 60 cattle. The De Witt family is passionate about goat farming. From left: Welmari, Dian (12), Erik and Widru (6). The livestock live mostly off the veld of the 1 164ha farm, which is a mix of grassland and shrub. Erik provides lick or supplemental feed only as needed. 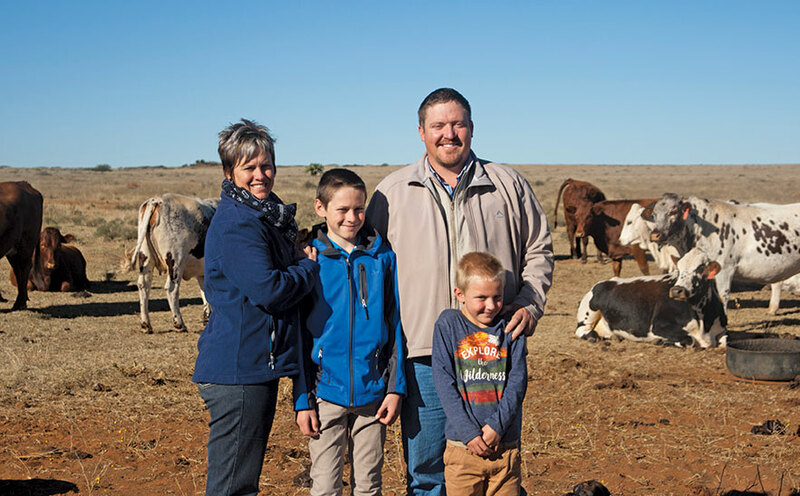 The De Witts live at their home in Koffiefontein and drive out to the farm, about 30km away, almost daily. Erik has one permanent employee who lives on-site, September Louw. His duties include putting out feed and water, kraaling smallstock at night, assisting with kidding and breeding, and alerting Erik to any emergency with the animals. The goats are a project near to Erik’s heart, and the rest of the family share his passion. “You have to like indigenous animals to want to breed them,” he says. Besides earning income, his main aim is to preserve and improve the breed. He tries to select for natural breed characteristics, including colour variations, build, long legs, hardiness and fertility. He does not overemphasise breeding for increased carcass weight, however, stressing the need for balance. 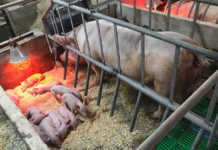 Trying to breed exclusively for increased meat runs the risk of losing traits such as walking ability, hardiness and mothering traits. Erik regards the phenotype of the rams as extremely important, and would sooner use a good-looking ram born as a single kid than a ram born as a twin or triplet but with the wrong build. He adds that breeding for hardiness is not easy; he had to sell off beautiful ewes from top mothers when he thinned out his goat herd as they were not hardy enough to live off the veld. “You can’t feed a goat to get a kid, otherwise you end up buying the kid back,” he says. He provides feed only to those ewes that are nursing kids. Although he keeps breeding records, he tends to first select visually and then refer to his records. “I don’t make any decision simply based on what it says on paper,” he says. According to Erik, dappled coats are currently very popular among IVG enthusiasts. A Xhosa Lob Ear with eye-catching dapples and good conformation will fetch top prices at auctions targeted at breeders or enthusiasts. People buying for traditional or ceremonial purposes are also among Erik’s most important goat buyers. Erik, who works in the auction trade daily as a livestock speculator for Vleissentraal, says that IVGs tend to perform very competitively against Boer goats in the ceremonial market space. He does admit that the market for indigenous goats is far better in KwaZulu-Natal (KZN) than in the central parts of the country. 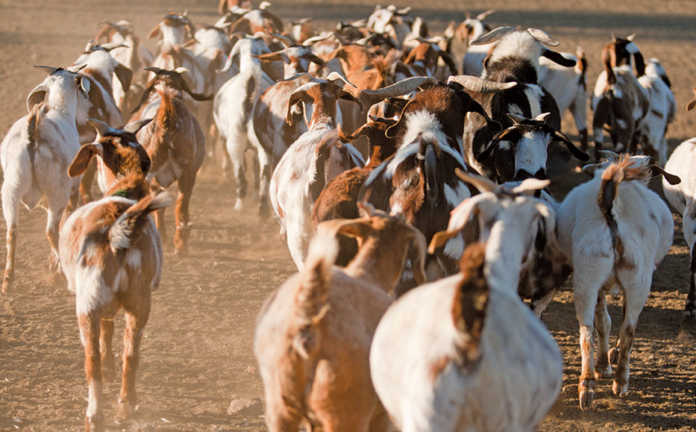 In KZN, bidders buy per animal, whereas in the Free State or Northern Cape goats are more likely to be sold on a per-kilogram basis. He overcomes this difficulty through effective marketing practices that include taking stock to select auctions such as national or regional breed-specific sales rather than general weekly meat sales. Using this approach with his sheep, he manages to earn the value of a 350-ewe flock from a flock of about 250. He is also willing to travel long distances, such as taking his goats to auctions in Pietermaritzburg. Erik’s top prices achieved to date are R10 000 for a Lob Ear ram and about R5 000 each for ewes bought at the farm. Twelve-year-old Dian is already an old hand at buying and selling goats after his father gave him and his siblings a few start-up goats each as a gift. Dian decided to sell his Lob Ears in exchange for Mbuzis and now has a silvery dun ram with a herd of ewes of just about every colour variety. He raised a portion of the funds for his Mbuzis after getting good prices for his Lob Ears during IVG sales held in Bloemfontein and Pietermaritzburg in May. His father funded the rest in exchange for his first eight ram kids. Five of these have now been born. Erik says that his daughter, Marduné, 14, who was at boarding school in Kimberley at the time of the visit, is equally passionate about farming. Widru is keen to start trading goats too, but first needs to understand certain concepts, his father says. At this stage, for example, he is not allowed to sell his ewe, Saartjie, who serves as a nanny for kids in need. Erik says that by allowing the children to own goats of their own, he can teach them the ins and outs of running their own businesses. “Dian needs to realise that one doesn’t get everything for free. He’ll have to give me back the eight ram kids that he owes me,” he says. Equally importantly, he stresses, by working together on the goats they are doing something as a family, with the aim of preserving something beautiful. 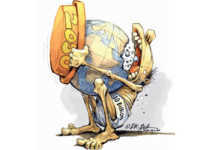 Phone Erik de Witt on 082 681 5999 or email him at [email protected].